I love the end of summer. By the end of the summer I’m ready for some routine, schedules, cooler weather and warmer food. I’ve hardly touched the sewing machine in 2 weeks….I guess I needed a break from sewing. 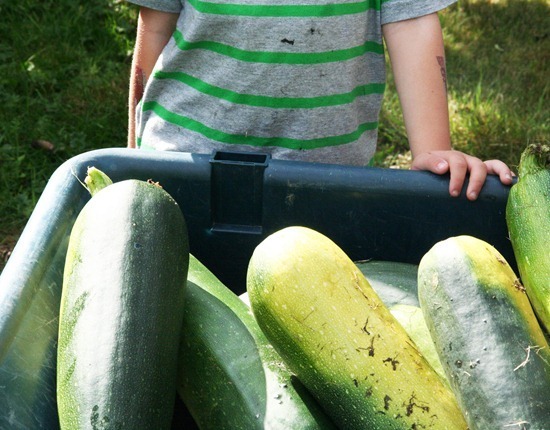 Instead I’ve been sitting around watching my kids play and eating zucchini in truckloads….since we have literally truck loads. Thank you for all your kind words on my Seville quilt. I’ll get the finished quilt pictures edited and posted this week. More on that quilt later…. I think that pattern is a great one…and seville is too! Thank you for your quick tutorial on Mme. Samm's wonderful site today. Enjoyed your tutorial at Stash Manicure today. I love that pattern, so quick and easy. Even though I'm an experienced quilter, I still like something I can finish in a short time. An especially useful pattern for using up one's stash. I love your tutorial at Stash Manicure!Thanks! Thanks for the tutorial at Stash Manicure! And I love the Seville quilt as well! HI Allison, I just came over from Stash, and joined you. I like your tutorial, in fact, it is just what I have been looking for, I have a collection of reds. ( just finished orange quilt top).I had a peak around your blog. Love your little helper! Hi Allison! Thank you for the tutorial over at Stash Manicure. I didn't know that pattern was so easy! Can't wait to try it. Great post on Stash Manicure! Thank you so much for your wonderful post at Madame Samm's this morning! Your patterns are so fresh and cool! My favorite is Seville although they are all awesome! Thanks for the great quilt tutorial at Sew We Quilt. This is a great baby quilt pattern also. So many possibilities. Thanks for the tutorial over at Stash Manicure. I can see that quilt with scrappy Halloween fabrics. I just might have to go check the Halloween stash upstairs! I know there's plenty of it!! I love that quilt, it has been on my to do list forever! Thanks Allison for the tutorial posted at Sew We Quilt. You are so talented. I love looking at all your quilts. Sew we quilt sent me over here, I'd be thrilled to win the Accuquilt! It gave me the push to become a follower; I've been reading your blog daily for months now and love your quilts. I even ordered one of your patterns to carry in my eBay store, and know I'll be adding more. Thanks for your post! Great quilt and tutorial at Stash Manicure. And your blog is wonderful. Your photos are great. I am a new follower, can't wait to see what you post next. 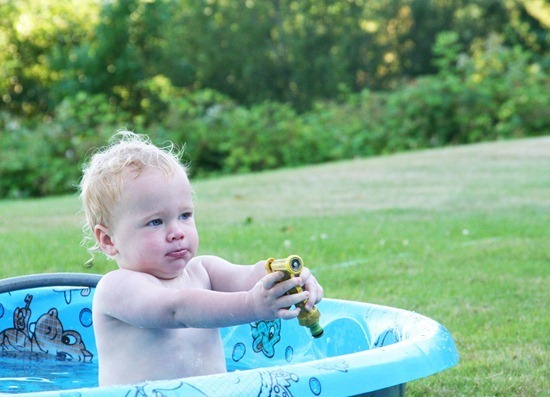 The picture of your little one in the pool is adorable! Your blog is very inspiring. Thank you for sharing your tricks of the trade. It is greatly appreciated. 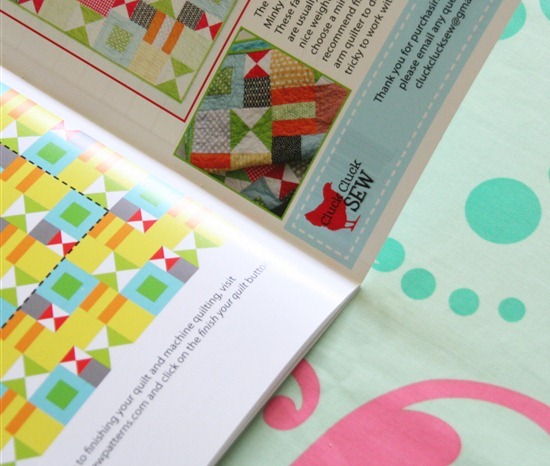 Saw you featured o Sew We Quilt :) I am glad 'cause you're awesome! Those are some seriously monster-sized zucchini. Do you have a good zucchini soup recipe? If not, let me know and I will pass one along. New follower here via Sew we Quilt. Many thanks for a great tutorial and I love the round pillow tutorial you have too. Thank you for being a part of the Sew We Quilt features. I love the look of your blog and I look forward to getting to know you! Great tutorial and it makes those squares so easy! Thanks so much for participating in the WannaBe program. I really appreciate your clear tutorial. It's simple enough that I think even I can follow it. :-) Have a fabulous day! And thanks again! I want this to be my next quilt. Very cool tutorial over at Stash Manicure! Glad you are a participant in the Wannabe giveaways/teaching! thanks! Loved your tutioral and your blog. Thanks! Great tut at SM! Thanks for sharing. Thanks for the tutorial at Madame Samm's! Thank you for the tutorial at Stash Manicure! Looks like a fun and quick way to make a cozy quilt. With summer coming to and end….I'm looking forward to some cooler weather but not snow!! I'm a new follower and will be visiting often. Enjoyed your tut at Sew We Quilt…..Thanks for sharing your great ideas!! What a great tutorial on Stash Manicure. Looking forward to reading your blog. Love the name of your blog. My kitchen has chickens here and there and the family just shakes their heads at me. Thanks for posting today on Stash Manicure. Love the quilt!! I'm thinging that would be a great baby shower gift. Thanks again. Thank you for this great tutorial you posted at Sew We Quilt Blog. I follow your blog, also and love it. i'm one of your new followers, come to look and sign up …. you do have lots of great tutes – i'll be back to browse! i enjoyed your tute for mme samm; i had preconcieved idea of stack and whacks [as in one block wonders] and you've whacked it right out of me. so one can stack and make any kind of cuts and play switchy-switchy! good to know! Allison! I am happy to follow. How great: cute quilts and redone dressers! Came over from sew we quilt after reading your guest post. You made it sound so easy and I love the quilt. I enjoyed your post over on Stash Manicure. I think I need to make one of these quilts. Thanks. Thanks for the great tutorial over at Sew We Quilt. I have become a follower of your blog. Thanks for your stack 'n whack tutorial! So easy-a must make!! love your tutorial today. I had bookmarked your site some time ago because I liked your style. Sure would be nice to win today! I love your Seville quilt. Can't wait to see it in a quilt shop. Congrats! I have been a follower of yours for a while and I am so glad to see you are part of a great give away today. I love your pattern. What a great block. You can use that pattern for so many great quilts. Thank you!! Thank You Allison for the wonderfully easy looking Tutorial you did for Sew we Quilt!! I think I can handle that one, especially since my Daughter informed me this Morning that I have a Grandbaby coming next April!! And I want to sew a Quilt for the New Addition!! I am following your super Fun Blog and I look forward to reading future post!! Thanks for the post at Stash today. I love your orange quilt. Love your spot on Madame Samm's today. Your truck load of zucchini reminds me of how my kids love it…shredded with a touch of garlic salt and Parmesan cheese…sauteed lightly.yummy tastes of summer!! Hi Allison, I have been a follower for some time now and want to thank you for the work you do and I love the stack and whack project and especially that it is in orange! Love this! This might be just the pattern to teach my 15 year old how to quilt! I need to hunt down your Seville quilt to have a look now! So sorry, I have you on my sidebar on my blog and have been following you but am now following you on your blog! Great easy stack and whack tutorial at Stach Manicure. 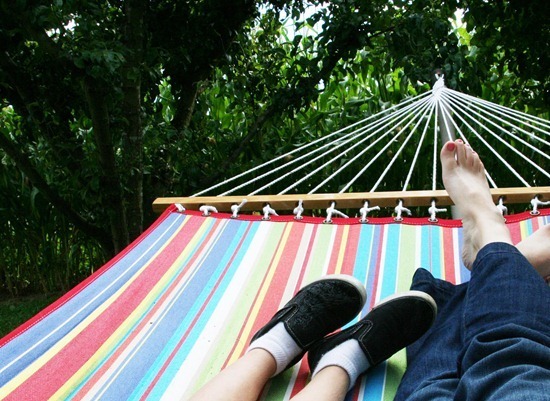 This is still on my bucket list :P. Love the summer pics with the hammock and the baby in the pool and all those zuchinni! The Seville quilt looks pretty spectacular. Allison, thanks for another great tutorial. I've been a follower of your blog for the last year and I love your awesome quilt and project tutorials although I've never made a comment before today. I especially love your tutorial on the Hourglass Quilt. Keep up the good work!!! Love your quilt on Sew We Quilt! It is definitely on my to do list! So pretty and easy too! I am now a follower via sewwequilt.com. I love all the beautiful color combinations you put together. I am looking forward to getting color inspiration for my 1st quilt. Also your tut on Madame Samm's blog was most helpful, especially for us 'k.i.s.s. '(keep it simple stupid) people. :-) I look forward to following your blog. Thanks for your Stack n’ Whack tutorial today over at Sew We Quilt. I hadn't thought of this as a S'n'W method before but think it's a great one to use for a new grandchild quilt for myself or a friend whose d-i-l is expecting. BTW, I'd love to win the draw! I'm a new follower and want to say thank you for the tutorial at Stash Manicure today. I appreciate all the time you spend making quilting easier for some of us. Thanks for the tutorial at Sew We Quilt. I am a new follower and look forward to future posts! I loved your tutorial for your stack n wack blocks. I love that idea. I would have never thought of it. (and I'm a follower)! I've just been over at Sew We Quilt and had to come and tell you I love the orange stack & whack. Like you say, a great beginner quilt or a "use some of my stash" quilt. I also like the one you posted Aug 24th. I'd love to win the Accuquilt – 3 dies I'd love to have are the Quarter Square 4" finished Triangle, the Rag & Circle and Chisels. I'll be following your blog so keep up the good work. P.S. Cute little one there! love your tutorial at Sew we Quilt, I am a follwer. I always enjoy your site! Great tutorial at Sew We Quilt. Hi Allison. I'm a follower and a fan–your blog name may be my favorite, ever. I loved your tile quilt; I have often thought of making a tile quilt myself, and your beautiful quilt reignited that desire. Thanks for sharing. thanks for the great post Sew we Quilt. I am a follower of your blog and would love to be the winner!!! Hi Allison, Thanks for the post at Madame Samms's — you now have a new follower. I can't wait to see what you're up to next and will be looking forward to your updates. Awesome quilt you made! I didn't know those blocks were that darn easy to make! I need to try to make some of those!!! Hi Alllison, that's my friend "Barb in Atlanta" that left the last comment. We're both sitting here at my laptop all excited about the Simple Stack n' Whack Blocks quilt you shared with us on Madame Samm's blog. Awesome! Simply awesome! You have shown us something that looks so hard and complicated, and you've shown us it's not really that difficult. Yippee-Yahoo!! I can't wait to try to maek my own. Thank you, thank you, thank you. I am now following you, I saw you over at Madame Samm's. You make that quilt look so easy and quick to make. Thanks for showing us how to make a Stack n' Whack. It would be so much fun to win an accuquilt. Thank you for the tutorial at Madam Samm's. You have a nice blog. Lovely tutorial at Sew We Quilt! Thank you for posting it. I will have to try it! Love the picture of toes. :) Thanks for the tute at Sew We Quilt. Thanks for the great tutorial at Sew we quilt. I love your quilts too, fresh colors.